Pro Flip Ads should start showing up if you install an add-on offered at pro-flip.apps-repo.net/us/install. The installer is actually stored on the Chrome web store at chrome.google.com/webstore/detail/pro-flip/jppdjelpfjhcodobgghbhdedeikmacfm. Of course, you might install the suspicious application form a third-party source as well. If that happens, it is very possible that you will acquire it bundled with malware or potentially unwanted programs. Needless to say, if malicious infections were installed packaged with this undesirable program, you need to make sure that you delete them before they cause any damage. In some cases, it can be difficult to figure out if malware is present because it can be camouflaged, and it might even enter your operating system without your notice. If you are completely lost, you should employ a trustworthy malware scanner right away. Needless to say, if you use a legitimate and up-to-date scanner, you will be informed that you need to remove Pro Flip as well. Continue reading why you need to get rid of this extension. According to our research, Pro Flip is represented by shopmania.ro, and it is compatible only with Google Chrome. 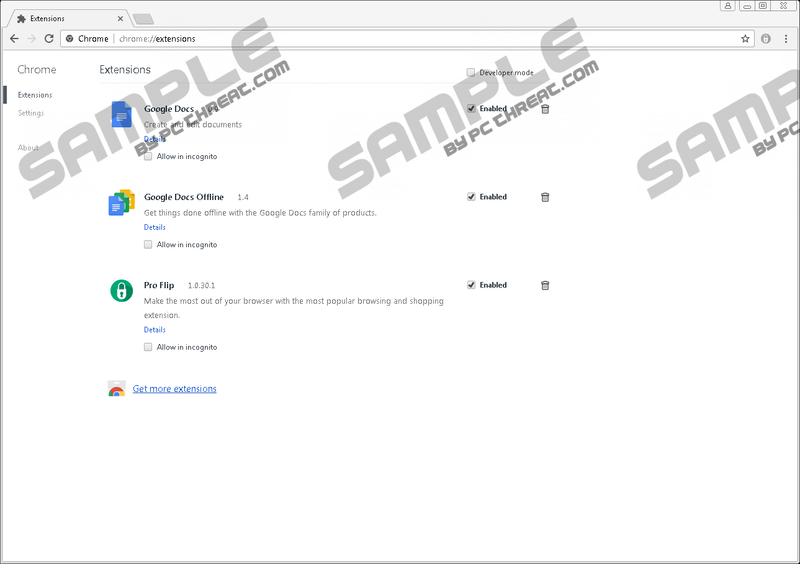 Officially, this extension is represented as a useful shopping assistant that allegedly can find the products you are researching for a better price. Ultimately, the extension works as an advertising tool that promotes less popular vendors, which is why we classify it as an advertising-supported program (adware). Needless to say, you are most likely to discover Pro Flip Ads when visiting online shopping websites. The data trackers installed by this adware should be able to monitor the content that you are viewing to ensure that Pro Flip Ads relevant. If you downloaded the suspicious extension from an official site, you must have been introduced to a pop-up informing that the app can “read and change all your data on the websites you visit.” Are you comfortable with that? Although the add-on should change the data by introducing you to beneficial shopping deals, are you sure that this function will not be used to introduce you to malicious content? The suspicious Pro Flip Ads – and, by the way, it is identical to Enhance Pro – does not appear to use tracking cookies for the collection of personal data, which is good news, but it can use them to record your location, the websites you visit, and other non-personal information. If you do not want this suspicious adware tracking every move you make, it is best to delete it immediately. If you end up interacting with the strange Pro Flip Ads, we suggest doing your own research to make sure that the deals offered are authentic and beneficial. The chances are that you will find much better deals and prices on your own because this adware might be paid to promote the products available on specific sites. Overall, it is unlikely that you will reap any benefits by using this suspicious application, and our recommendation for you is to delete it as soon as possible. The good news is that this adware can be eliminated by taking a few simple steps. Although you can delete Pro Flip Ads by eliminating the add-on via the chrome://extensions/ menu, we suggest resetting your Google Chrome browser altogether. If you reset your browser, all data trackers will be erased as well, and that is what you want. If you do not get rid of the cookies and beacons and other elements, information about you will continue being recorded. Of course, manual removal might not be the best option if other threats are found. If they are, use an anti-malware tool that can automatically erase all undesirable infections. If this I the path you choose, you do not need to worry about the removal of Pro Flip separately because this ad-supported program will be eliminated along with all other infections. If you have any questions about this adware, the ads it shows, or the removal process, feel free to add them in the comments section below. Our experts will try to help you as soon as possible. Tap Alt+F keys to open the menu on the right. Click the Reset button and then restart the browser. Adjust homepage and search provider settings if needed. Install a legitimate malware scanner to inspect your PC. Quick & tested solution for Pro Flip Ads removal.